Lots of good stuff this week. Let’s go! 1) The Economist on how libertarians hijacked liberal economics. 2) Daniel Craig on Hollywood’s sexist double-standard on aging. And, he’s a great Bond. 3) Vox puts the shocking arrest of a SC student into the larger context of the policy of police in schools. And some good Amy Davidson commentary on the matter. And a good take on the racial component from Jamelle Bouie. 4) Nice NYT Editorial on the concealed carry fantasy. 5) This article about Jeb’s flailing campaign was even before his poor debate performance. There’s just no way this guy is going to be president. They didn’t have to look far for an explanation. All they had to do was listen to Jeb on Saturday in South Carolina. Bush is correct that Trump’s campaign of insults has made the 2016 GOP primary race an ugly affair. But his response — suggesting he’d take his ball and go home rather than sully himself — is precisely what has sunk Bush’s candidacy so far. Angry voters want a fighter, and Bush, justifiably dubbed “low-energy” by Trump, doesn’t seem to have it in him. The way to combat Trump’s demagoguery and race-baiting is not to look down your nose at him and say “Tut-tut.” It’s to hit Trump back with as much force as he delivers. 6) Great interview with Anne-Marie Slaughter about her new book. Short version: our society really needs to start truly valuing giving care to others. 7) It is interesting to learn that Florida and Texas are doing surprisingly well in teaching their students. But damn it, it would be a lot more interesting if we actually knew why. 8) Leadership mistakes of the Galactic Empire from Star Wars. Awesomeness. 9) Are we becoming inured to TV shows killing off main characters? Consider this: The United States replaced the regime in Iraq and gave the new one massive assistance for a decade. The result? Chaos and humanitarian tragedy. Washington toppled Moammar Gadhafi’s regime in Libya but chose not to attempt nation-building in that country. The result has been chaos and humanitarian tragedy. Washington supported a negotiated removal of Ali Abdullah Saleh’s regime in Yemen and the election that followed, but generally took a back seat. The result again was chaos and humanitarian tragedy. The reality in that part of the world is that many of its regimes are fragile, presiding over weak institutions, little civil society, and often no sense of nationhood itself. In that situation, outside interventions, however well-meaning, might not make things better. Sometimes they can even make things worse. 11) Yes, LARC’s are awesome, but they are way under-used. 12) How the disappearance of large animals, and their poop, can disrupt ecosystems. 13) Why is academic writing so bad? 14) I love candy corn. And since Sarah does too, we even eat at not just at Halloween. Really enjoyed this National Geographic story on the history of it. 15) The Memory Palace is one of my favorite podcasts and it definitely deserves more popularity. This episode on lead and the wrongness of America may have been my favorite so far. 16) Enough with turning things pink and thinking you are actually doing something about women’s health. 17) REI is closing its stores on Black Friday and encouraging it’s employees and customers to get outside instead. Not that I shop at REI, but I totally plan on taking them up on it (hope to do some hiking in the NC mountains that day). Jennifer Victor with a really nice Mischiefs of Faction post looking at the different metrics with which to approach this question. She suggests (And I strongly agree) that prediction markets are probably the best predictor at this point. And what do we see there? That looks about right to me. It’s funny, though, Rubio has everything you need to win the nomination except strong popular support, good fundraising, and endorsements (as her other charts show). But if you follow the logic (and the political science) of nominations, he just seems to be the most obvious choice and I think that is what these markets reflect. 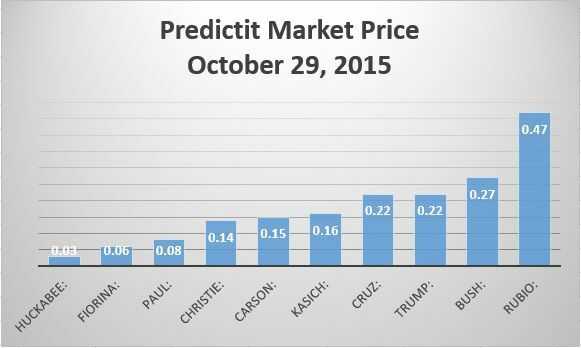 I’d also suggest a few of these guys are way over-valued (yes, Huckabee at anything over 0.001% is over-valued). Given how things have gone recently, it’s sure a good time to short Jeb. I was trying to come up with a sports analogy for Rubio for my father-in-law and I struggled, but ended up with a team that’s stockpiled a bunch of high draft picks. Not all that good, but Rubio seems to have all the qualities that make him the strongest contender, except for current polling, money, endorsements, etc., but it is quite easy to imagine a scenario where he makes rapid progress in all of these. On the one hand, this is infuriating. On the other, if it helps to change our country’s self-defeating approach to drug policy more broadly, I’ll take it. Hopefully, it will. Everyone knows that if you make a mess, you have to pay for it or clean it up. Companies know this, drivers know this—even kids know it. What most people don’t realize is that even in cases where prosecutors’ misconduct or negligence results in gross violations of due process, colossal disruptions of the criminal justice system, or grave threats to public safety, prosecutors remain essentially immune from any real consequences. [emphasis mine] When the people who wield the most power in the criminal justice system are also the least accountable, constitutional crises like those unfolding in Orange County and Massachusetts are almost inevitable. Over the past decade, crime lab scandals have plagued at least 20 states, as well as the FBI. We know that one of the unintended consequences of the war on drugs has been a rush to prosecute and convict and that crime labs have not operated with sufficient independence from prosecutors’ offices in many instances. Their mistakes ruin lives. Years of deliberate falsification have ruined thousands of lives. We also know that there remains almost no reason for a prosecutor’s office to admit error and that the cost of fixing those errors can become prohibitive. So what do we do when a scandal infects hundreds or thousands of prosecutions? If Massachusetts is any indication, even three years later, we still don’t do all that much. Ugh. There’s a lot that we need to do to reform our criminal justice system and I’m not quite sure how far up the list this should be, but damnit, doubtless a key principle of reform should be that prosecutors are accountable! Pretty much everybody else in society is. There’s lots more science policy-related questions (GMO, vaccinations, animal research, etc.) in there worth taking a look at, but I was most struck by the idea that Americans believe that foods they eat every single day are actually unsafe. Now, of course, there’s actually plenty to be concerned about with pesticides and we should take these risks seriously, but if this is true (another reason to not quite trust public opinion) most Americans are either 1) comfortable eating food every day that they actually consider unsafe, or 2) think pesticides are unsafe, but don’t actually care enough to be aware that much of the food they eat is grown with pesticides. There are those, of course, who are rigorously organic, but that is obviously a very small portion of the population. Cruz’s attack on the moderators was smart politics — but it was almost precisely backwards. The questions in the CNBC debate, though relentlessly tough, were easily the most substantive of the debates so far. And the problem for Republicans is that substantive questions about their policy proposals end up sounding like hostile attacks — but that’s because the policy proposals are ridiculous, not because the questions are actually unfair. The Republican primary has thus far been a festival of outlandish policy. [emphasis mine] The candidates seem to be competing to craft the tax plan that gives the largest tax cut to the rich while blowing the biggest hole in the deficit (a competition that, as of tonight, Ted Cruzappears to be winning). And the problem is when you ask about those plans, simply stating the facts of the policies sounds like you’re leveling a devastating attack. Oh, sure you can find examples of unrealistic policy proposals from the Democratic debate, but that is mostly because they are politically unrealistic, not because the numbers are pure rainbows and unicorns fantasy. Sadly, a man whose entire campaign is mostly vague unicorns, rainbows, absurd Nazi and slavery analogies, and brushing off anything pointing this out as “political correctness” (Carson, just to be clear) is doing as well as anybody. That’s what our modern day GOP has come to. Meanwhile, somebody I disagree with, but is at least serious (Kasich) languishes at under 5% in the polls.